Gastric bypass surgery (Roux-en-Y gastric bypass) is one of the weight loss surgeries that combine both restrictive and malabsorptive mechanisms to achieve weight loss and reversal of comorbid conditions. 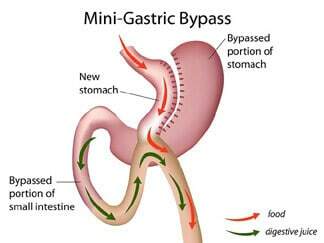 Mini Gastric Bypass (MGB) surgery was first performed in the U.S. by Dr. Robert Rutledge in 1997. Since then, many have been done with success stories. However, some surgeons are still skeptical about MGB due to the assumed potential complications. Nevertheless, MGB surgery offers several advantages over the traditional gastric bypass surgery. How does Mini Gastric Bypass differ from Roux-en-Y Gastric Bypass Surgery? In proximal Roux-en-Y gastric bypass surgery, the stomach size is reduced by the creation of a pouch of about 30mls from the upper part of the stomach with the use of staples. The small bowel is then divided at about 45cm from the stomach with the distal end connected to the pouch and the proximal end to the small bowel at about 145cm from the stomach. Thus two areas of anastomoses are created; the gastrojejunostomy and the jejunojejunostomy. In MGB surgery, the stomach is divided to create a tubular pouch that is similar to that of a gastric sleeve. The surgeon then takes a loop of the small bowel at about 2m (6-7feet) from the stomach and join (anastomose) it to the tubular pouch. By this, the food bypasses about 2m of the small intestine. Ready for Mini Gastric Bypass in Mexico? Learn more about this great bariatric option from our highly educated bariatric coordinators. Weight Loss Surgery in Tijuana is a viable option for those who lack insurance or who don’t have the cash to self-pay in the US. How does Mini Gastric Bypass induce weight loss? The mechanism of weight loss after the mini gastric bypass is similar to that of Roux-en-Y gastric bypass. The stomach pouch accommodates the only small quantity of food leading to calorie restriction. The food avoids 6-7 feet of the small intestine where most of the absorption takes place resulting in malabsorption. Indications for MGB surgery are similar to that of Roux-en-Y gastric bypass (RYGB) surgery. A patient with a body-mass index (BMI) >40 kg/m or BMI >35 kg/m with one or more obesity associated disease condition is eligible for MGB surgery. It can also be done for obese individuals who have failed to achieve significant weight loss with non-surgical methods. How effective is Mini Gastric Bypass Surgery? Many studies have shown that MGB has similar efficacy with RYGB in terms of weight loss and resolution of comorbid conditions while others revealed that MBG is more efficient than RYGB. This is in addition to other benefits such as: reduce the time of surgery, shorter learning curve, and lesser major complications. Five years after surgery, the percentage excess weight loss for MGB was 72.9% and BMI of 27.7kg/m2. These were better than percentage excess weight loss of 60.1% and BMI of 29.2kg/m2 recorded for patients with RYGB. This finding is also similar to that of Lee et al. where the percentage excess weight loss was greater in MGB group than in RYGB group one year post-surgery 64.9% vs. 58.7%. However, not much difference was observed 2 years post-surgery. Remission of type 2 diabetes mellitus was also better in patients who had MGB surgery as compared to RYGB and gastric sleeve surgeries. Complications of Mini Gastric Bypass Surgery? Esophageal and gastric cancer – This is a condition that has been assumed to complicate MGB surgery due to the risk of bile acid reflux into the pouch and esophagus due to the loop configuration of the small intestine. However, no concrete evidence to support this assumption, and there hasn’t been any report of esophageal cancer following MGB. The only case of gastric cancer that was reported after MGB was not found in the pouch but in the bypassed stomach. Gastroesophageal reflux disease (GERD) – This is the reflux of acidic contents of the stomach into the esophagus resulting in heartburn. Although RYGB surgery is preferred against gastric sleeve surgery for obese patients with heartburn, cases of GERD has been reported after RYGB surgery. However, the chance of revision surgery due to GERD is lesser following MGB than gastric sleeve surgery.1Nevertheless, no significant difference in symptoms of heartburn or regurgitation was observed between MGB and RYGB. Marginal ulcer – The incidence of this is not different from RYGB surgery. Internal hernia/intestinal obstruction – This is very rare following MGB as opposed to RYGB surgery where the incidence can be as high as 6%. In conclusion, mini gastric bypass surgery is an effective bariatric surgery combining both restrictive and malabsorptive mechanisms to induce weight loss. Though there has been a growing concern among few surgeons on the risk of gastric and esophageal cancer following this procedure, this has not been supported by any tangible evidence. Mahawar KK, Kumar P, Carr WR, et al. Current status of mini-gastric bypass. Journal of Minimal Access Surgery. 2016;12(4):305-310. doi:10.4103/0972-9941.181352. Lee W-J, Yu P-J, Wang W, Chen T-C, Wei P-L, Huang M-T. Laparoscopic Roux-en-Y Versus Mini-Gastric Bypass for the Treatment of Morbid Obesity: A Prospective Randomized Controlled Clinical Trial. Annals of Surgery. 2005;242(1):20-28. doi:10.1097/01.sla.0000167762.46568.98. Quan Y, Huang A, Ye M, et al. Efficacy of Laparoscopic Mini Gastric Bypass for Obesity and Type 2 Diabetes Mellitus: A Systematic Review and Meta-Analysis. Gastroenterology Research and Practice. 2015;2015:152852. doi:10.1155/2015/152852. Ready for Mini Gastric Bypass in Mexico? Learn more about this great bariatric option from our highly educated bariatric coordinators.